The current spring real estate market. Everyone wants to talk about it — and everyone is probably sick of hearing so many unqualified opinions. “The market’s up!” Or, “The market’s down!” We’re here with some actual expertise and experience — and some good news. Knowledge is power. Know how much your home is worth? We do. In our qualified opinion, the current spring real estate market is normal and balanced with a few soft spots tied with good opportunities for smart sellers. Sellers must position their homes carefully to be successful (including potentially updating, as seen above). If you’re thinking about selling, here are a few points to consider. Listing Price is King. This is especially true in the higher price points (above $2.5M in the Park Cities and Preston Hollow and $1.5M in Lakewood), where a surplus of inventory has created competition. Homes that are fairly priced when first listed spend far fewer days on market and typically net the seller the most amount of money. Potential buyers see your property most immediately upon listing — and if your listing is overpriced, you’ll miss out. This isn’t eBay — buyers don’t go back over and over to see if the price changed; they simply move on. Getting the right pricing advice isn’t easy. Hiring an agent who has the proper type of pricing experience might be the most important decision you make. The goal? Ask the highest price possible to generate an offer in the first 30-45 days. Prices change from block to block, week to week. It takes a lot of time to get the expertise you need to know what would work best for your street. Take Advantage of Early Activity: The spring real estate market arrived early this year. We would attribute that to sellers being more realistic about price (see above point) and the likelihood of interest rates increasing soon. Also, new inventory seems to be gaining the interest of previously dormant buyers who have been waiting to act. If you’ve been thinking about selling, you might want to get moving soon. Lower Prices in Each Neighborhood Move Fast. All over town, homes in the lower price brackets for their respective neighborhoods are selling most quickly. In Lakewood, the majority of properties listed under and around $750K are turning more quickly than anything else. This is in large part due to the coveted public elementary schools, which offer a welcome alternative to families not interested in private education. In particular, schools like Lakewood Elementary, Mockingbird Elementary, and even Hexter Elementary in Old Lake Highlands are bringing great value to the neighborhood. In the Park Cities, homes listed under $1.5 million are extremely competitive. 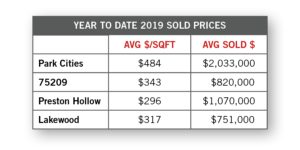 Represents comparison of neighborhood homes sold pricing averages during 2019. Update Before Listing. Buyers disproportionately discount properties with outdated finishes. Just as important as a correct price, a home update elevates the value and increases your selling power. Buyers are much more willing (and expect) to pay a premium for updated finishes. And these updates can be easier and less expensive than you think. For tips, check out The Rhodes Group’s simple ways to increase your home value. Use Compass Concierge. Being at the forefront of real estate means we offer things no one else does, like Compass Concierge, which will front the cost for pre-sale improvements. That way you don’t have to pay for the upgrades until the house is closed. It’s a great way to maximize value. It’s easy and it works. One of our clients has already, and the results (pictured above) speak for themselves. All in all, “normal” market conditions are expected to continue throughout this spring real estate market selling season. Positioning your property effectively at the right price and with the right updates can give you an advantage. And if you ever have any questions, you know who to email — us. We grew up here. We live here. 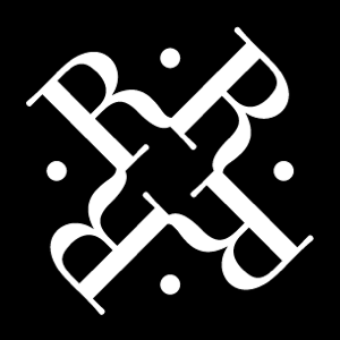 The Rhodes Group has been buying and selling Dallas real estate in the area for two generations, immersed in the ebbs and flows of the local luxury real estate markets. We know your neighborhood.